Natillas is a term in Spanish for a variety of custards and similar delicacies in the Spanish-speaking world. In Spain, this term refers to a custard dish made with milk and eggs, similar to other European creams as crème anglaise. 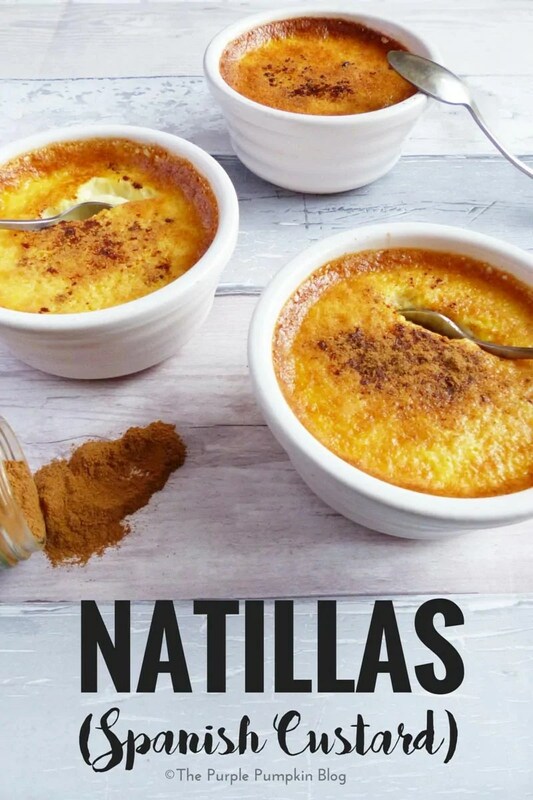 In Spain, natillas is a custard dish typically made with milk, sugar, vanilla, eggs, and cinnamon. The dish is prepared by gently boiling the milk and slowly stirring in the eggs (often just the yolks) and other ingredients to create a sweet custard. 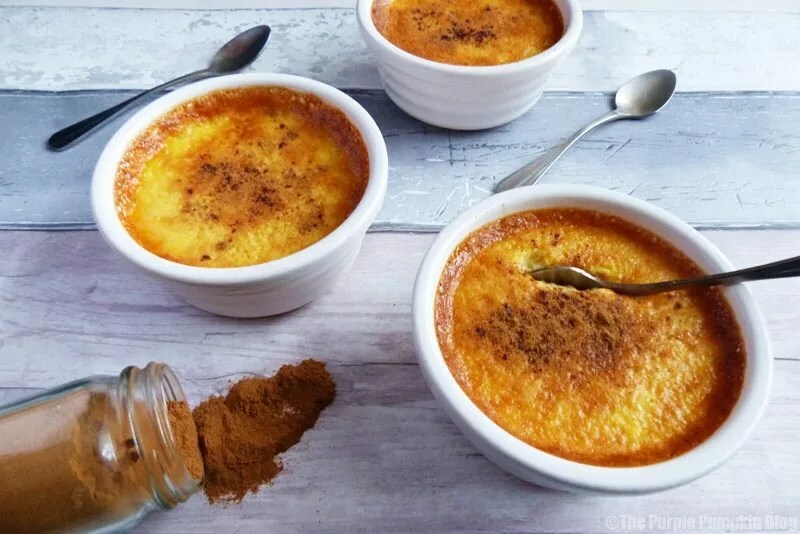 The differences between Spanish natillas, English custard or French crème anglaise are vague, mainly related to their thickness. – Wikipedia. So now you know what natillas is, I’ll tell you how I made it using the Tefal Cuisine Companion that I reviewed last week. It was prepared in the machine, with the final cooking being in small dishes, cooked in the oven in a bain marie. A bain marie (also known as a water bath), is when you place the dish/es that you want to cook, inside an ovenproof dish, and fill with water, so that the dishes cook evenly. It is often used to cook things like crème brûlée, cheesecake, terrines and pâtés. We had to adjust the recipe from the one in Tefal’s 1 Million Menus book, because we didn’t have any semi-skimmed milk, and all the shops were closed, so couldn’t buy any either. So we used skimmed milk, reducing the quantity by 100ml, and added some fat, in the form of a little bit of melted butter. We also doubled up the quantity of vanilla extract. I would say that this pudding is part way between a custard and a crème brûlée. It tasted very good! Much like the Asian Style Pot Au Feu recipe that I prepared in the Cuisine Companion, but I also said it could be made without; the same goes for the natillas recipe. But upon my reading of making custard, you would have to stir it constantly in a bowl over a pan of simmer water, so that you don’t over-cook and curdle it, before finishing it off in the oven. Since I’ve not actually tried it, I will only suggest what you could do here – it would be a bit trial and error! This recipe is made using the Tefal Cuisine Companion. If you do not have this appliance, you can still try making this. For step 2, whisk the egg yolks and sugar in a bowl until combined, and then add the milk and vanilla. Place the bowl over a pan of simmering water, making sure that the bowl and water do not touch, and heat gently, whisking continuously until starting to thicken - around 5 minutes. Continue following recipe from step 3. Place the eggs yolks and sugar in the Cuisine Companion bowl fitted with the whisk. Mix at speed 6 for 1 minute. After 30 seconds, add the milk and vanilla. Launch the dessert program at 70C at speed 6 for 5 minutes. At the end of cooking, pour the mixture into ramekins. Place the ramekins in a bain-marie and bake for 25 minutes) until just set. You could serve this with caramel or a fruit coulis. Asian Style Pot Au Feu	The Big Spring Cleaning & Decluttering Mission! What a lovely dish I love the golden brown crust on the top. I love anything custardlike and my mum used to make these. Yum! I have seen this in Nandos and always wondered what it actually was. Looks delicious! Ooh, you too like a bit of #cheekynandos! This was delish, and simple to make too.